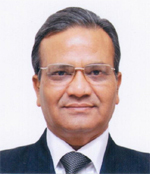 Dr. Shiv Dutt Gupta is a leading public Health professional with a distinguished academic and research career. He obtained his M.D. (Preventive & Social Medicine) from India, and Ph.D. (Epidemiology) from Johns Hopkins University, Baltimore, USA. He was conferred Fellowship of Academy of Medical Science, India (FAMS) for his outstanding contribution in the field of public health. He has done pioneering work of creating and establishing new discipline of health management, and promoting research in health policy and health systems and programmes. Currently Dr Gupta is Director, Indian Institute of Health Management Research (IIHMR), India and President, IIHMR University. Dr Gupta is Adjunct Professor at the Johns Hopkins University, USA and Visiting Professor at University of Chester, UK. He is Director, WHO Collaborating Centre for District Health Systems at IIHMR facilitating management research and interventions in the health systems in order to improve efficiency and effectiveness of health care. He is the President Elect of WHO SEARO supported South East Asia Public Health Education Network (SEAPHEIN). Prior to this, he was the Secretary General of SEAPHEIN. He is the Editor of Journal of Health Management published quarterly by SAGE Publications, New Delhi. Dr. Gupta has served as Temporary Advisor to SEARO WHO on several consultation processes. He has served as member of the Technical Review Panel of the Global Fund. He is member of several research advisory committees of the Indian Council of Medical Research (ICMR) and Chairs Project Review Committee of Department of Health Research, Government of India. He has championed the cause of quality improvement and capacity building in health care in India and South East Asia. Over the past three and a half decades of his distinguished career, he has completed more than 100 research studies and projects supported by various organizations/agencies and have more than 100 research publications to his credit. The areas of research include: public health and epidemiology, population, reproductive health and nutrition, health systems and management in the health sector. Dr. Gupta is the recipient of QIMPRO Gold Standard Award 2009 for Healthcare.